As some of you know, someone close to me has been suffering from severe depression for the last few months, so I've been reading lots of self-help books and trying to push the better ones in their direction. 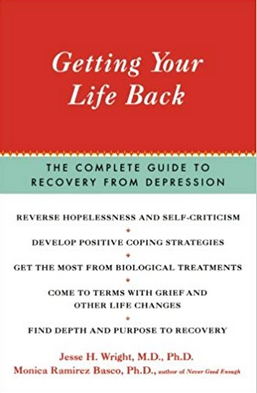 Getting Your Life Back is nearly twenty years old, but it's a thorough and logical workbook which leads the depressed person step by step through useful approaches toward recovery. Jesse Wright and Monica Basco divide their method into five crucial 'keys': Thinking, Action, Biology, Relationships and Spirituality. Each emphasises a different element -- the Thinking section tackles distorted thoughts via CBT; Action encourages a healthy approach to exercise, nutrition and sleep; Biology offers a comprehensive (though possibly slightly dated now) overview of anti-depressant medications and chemical imbalance in the brain; and the Relationship section gives useful and sensible advice to improve your interactions with others. The Spirituality Key is perhaps the boldest, exploring ways to find meaning, purpose and connection, whether it be a religious path, devotion to family, creativity, or giving to the community. All these Keys are important for each of us to lead a balanced and fulfilling, though not every depressed person will find all the sections equally helpful. 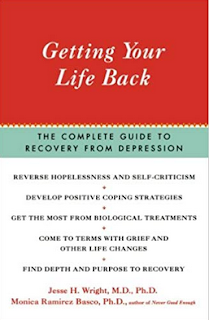 Working your way through this book, which includes worksheets, questionnaires and exercises to complete, would certainly benefit anyone struggling with depression. My only concern is that they might find the task too daunting; you'd need to be pretty motivated to tackle the whole thing, and if you have that much motivation to get well, you're halfway there already.